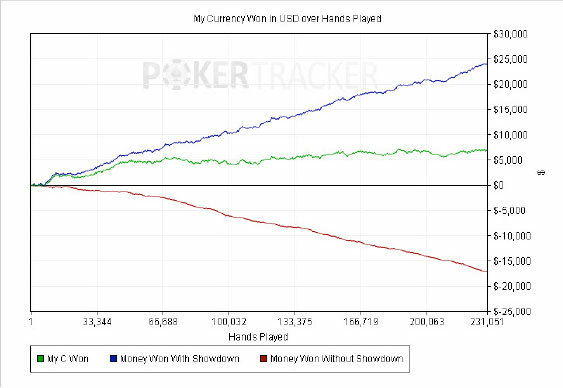 In the olden days of online poker (and by that I mean just a few years ago) an active online poker player might graph his or her results to review a single green line telling you how much money they had won over however many hands. Those early graphs couldn't be simpler. But then, one day, two new lines were introduced to poker graphs that represented a new way to consider winnings and things haven’t been the same since. Now instead of a single green line, we have the blue line and the red line. 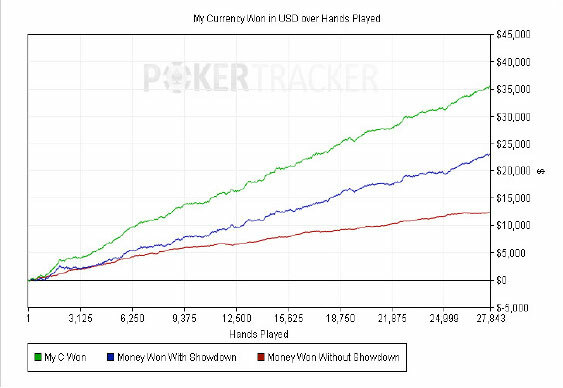 In most poker tracking tools, these new graph lines are displayed when the Showdown / Non SD Winnings option is checked. Many players look at their personal results graph when the “Rainbow” of Green, Red, and Blue is displayed at the same time, but they are not sure what to make of it. The average player has a negative red line which creates this “alligator mouth” view; the red line is negative, the blue line is very positive, and the green line is somewhere in the middle. What creates this unique alligator mouth shape? Well, the biggest culprit by far is the inclusion of the blinds. Let’s review two Personal Results graphs from the same player over the same sample size. The graph shown above is the player's normal Personal Results Graph which shows all winnings with showdowns and non-showdowns from all positions and all hands, regardless of whether the player participated in the pot. Conversely, the Personal Results graph shown below has a filter added for VPIP = TRUE (Voluntarily Put Money In Pot. This means the player has invested chips in the hand, the posting of blinds not included). Notice that once the VPIP = TRUE filter is added the blue, red, and green lines all become very positive. The biggest drag on our overall profits are those pesky blinds and, since we don't tend to play many pots from the blinds (yet alone see a showdown), they get counted in our red line when the graph is unfiltered. Now if you filter for VPIP = TRUE and any of your lines are negative over a reasonable sample size, then you have a huge problem and you should start studying to find the source of your leak. Players who don't steal enough pre-flop are frequently not picking up those cheap and easy pots pre-flop. If you win enough of these small pots it will greatly increase your win-rate and alter your image to appear that you are a very active player; and the more active you are, the more likely your opponents will pay you off when the pots are large. These spots give you a great chance to either pick the pot up pre-flop or win the pot later with good bluff c-bets, both of which contribute to a positive red line. If your red line is negative you want to look first at your stealing and ensure you’re stealing enough and picking the right spots. A great way to do this in PokerTracker 4 is to run a filter only to show hands where you attempted to steal by turning on Actions and Opportunities - Preflop > Preflop Raises > Attempted Steal. Enabling this filter will allow you to see how often you are picking up pots pre-flop with the “Stole” stat. If this is really high you certainly want to start looking for more steals in your game. Next let’s explore how you perform when facing three-bets. The red line influencers here are when calling three-bets, as well as when you four-bet when facing a bet. Given the magnitude of these pots (either calling a three-bet for anywhere between 9 and 12bbs on average, or four-betting for 20 to25bbs or greater), it is easy to see that any mistakes can add up and quickly hurt your red line, and thus affect your green line as well. Add some basic filters to review these pots such as Actions and Opportunities - Preflop > Preflop Calls > Called 3Bet or Actions and Opportunities - Preflop > Preflop Raises > Any 4Bet to review these hands both in your tracker’s report, as well as in the Personal Results Graph. If you're showing up with a lot of junky hands when these filters are run, then you certainly want to rethink this part of your game. One trick I suggest is to review your overall Personal Resuts Graph, but focus only on the red Won Without Showdown line. If you see a lot of sharp drops in the red line, and you have a large sample size to review from, then we can almost guarantee you that you are making a lot of mistakes when facing pre-flop three-bets. Lastly, let’s also review your c-bets. Filter to review your flop c-bets by selecting Actions and Opportunities - Flop > Flop Bets > Bet Flop - Continuation Bet to see if you are either bluffing too often or possibly too little. Many players with poor red line results tend to bluff c-bet too rarely. They end up giving up on pots that could have been stolen quite easily. 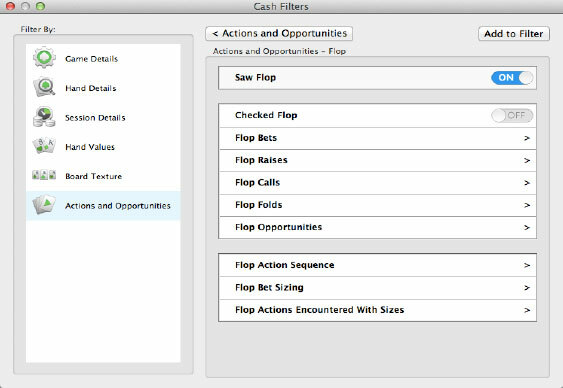 If you think you may have issues with your c-betting frequency, then set a filter for (Raised Preflop Any Raise) and (Saw Flop) by selecting Actions and Opportunities - Preflop > Preflop Raises > Raised Preflop - Any Raise and then also select Actions and Opportunities - Flop > Saw Flop to review your c-betting frequency to see if you are accidentally passing up on any good opportunities. 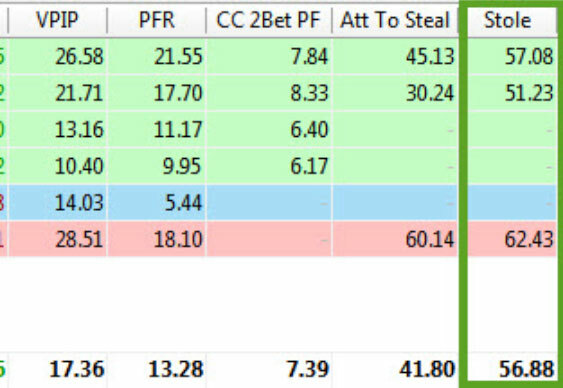 Although the focus of this article has been showdown and non-showdown winnings, the truth is that when you are reviewing your Personal Results Graph it is best to care less about the red and blue lines; instead focus more on the green total winnings line. That being said, if your red line is more negative than it should be, then there are many aspects of your game that you can explore to help find and patch leaks. Be diligent in your study, review the areas of your gameplay where you pick up non-showdown pots easily, and employ solid aggression to improve the slope of all three of your graph’s green, red and blue lines. Good luck and happy grinding! James Sweeney is a noted poker coach, and author of the book "Dynamic Full Ring Poker: Beyond the Basics" published by Daily Variance. James contributed to the tutorial content development and support of PokerTracker 4, and remains an active player advisor to the PokerTracker management team. His single-serve coaching video content is available at www.splitsuit.com/shop, featuring his newest release "How To Study Poker And Improve".